Periodically Ol' Myrt here posts the "timestamped" version of our Mondays with Myrt Hangout on Air, but admittedly I don't like to do it. WHY? It's much better when you join our free Google+ community, to keep up with all the comments back and forth posted before, during and after each Hangouts on Air. The video itself is available freely on Google+ public stream (sans comments), on YouTube (sans comments) and on my blog (sans comments). WHY keep all the comments in once place? WHY would +Cousin Russ and Ol' Myrt here do this to you? So the conversation can continue - PERIOD. Here's the embedded video (sans comments) of Mondays with Myrt - 23 Mar 2015. Here's the "timestamp" Mondays with Myrt - 23 Mar 2015 (sans comments) created by +Cousin Russ . Remember, you may click a timestamp and go directly to that portion of the Hangout on Air. We have included hyperlinks discussed during the show. 00:00 » Myrt welcomes everyone and gathers weather reports from our panelists and viewers throughout the world. 02:48 » United Nations Decade for People of African Descent - Everyone can share Myrt's collage with their local genealogy societies for newsletter and presentation slides. 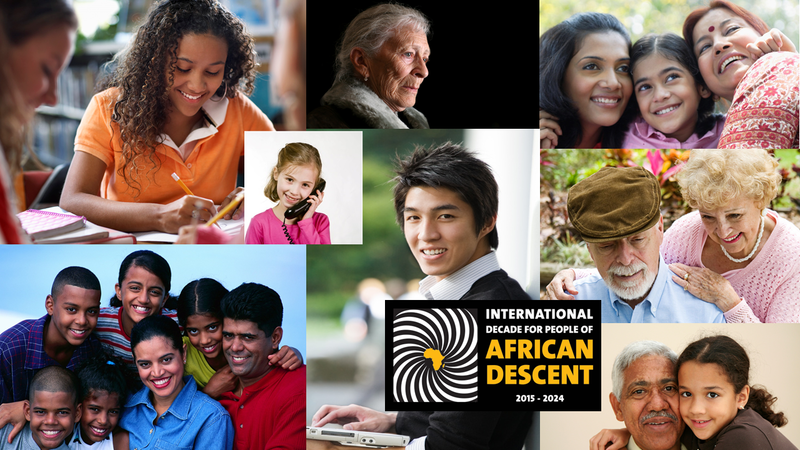 Myrt's original intent was to incorporate the copyright-free "International Decade for People of African Descent 2015-2024" logo from the UN into a collage of African Americans. Then it dawned on Ol' Myrt that she wishes to reach out to all regardless of race, color, creed or national origin with support for researching family and documenting cultural heritage. 27:10 » Is Google+ Dead? DearMYRTLE favors this quote "But don’t write the obituary yet. It would be a mistake to call this a retreat, or an admission of failure. This is actually Google doing what Google does best: relentlessly optimizing its products based on data and feedback." 1:38:18 » HANGOUTS: Pay what you want by DearMYRTLE. You've got to wonder about the 142 comments collected this far. Why not head over to VIEW and COMMENT over on DearMYRTLE's Genealogy Community?